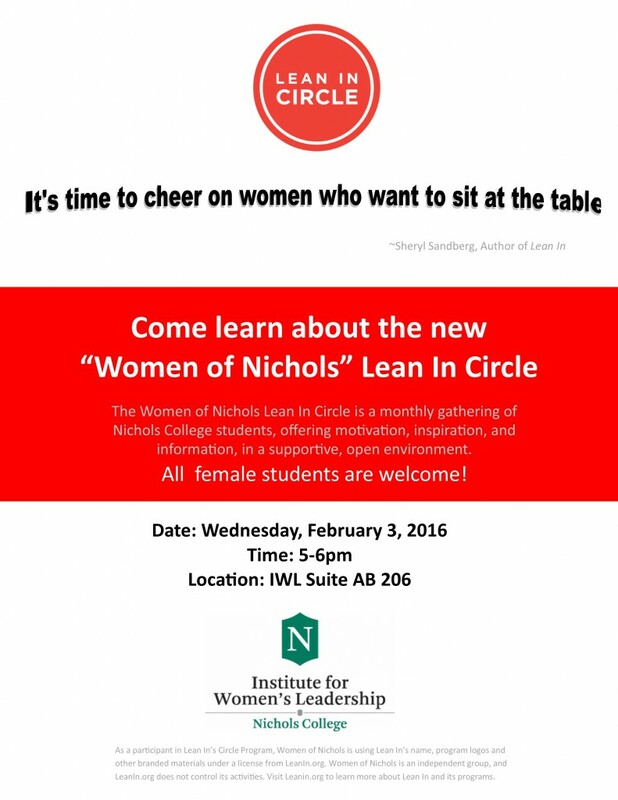 Trending topic of the week over here at the IWL is our upcoming student Lean In Circle on Wednesday February 3, 2016. First things first, this is NOT A BOOK CLUB. The purpose of Lean in Circles is to bring the females of communities closer together by generating discussion about topics presented in Sheryl Sandberg’s best-selling book, Lean In. The Circle provides females with a safe and comfortable environment to discuss and learn about topics including: work-life balance, confidence, feminism, leadership, and so much more. Our goal at the Nichols College IWL Lean In Circles is to enable the female student body to gain insight and knowledge from others in the group. The topic of discussion for the February 3 Circle is Feminism. We are going to explore what feminism means to different individuals, talk about men as feminists, and consider the difference between a good and bad feminist. All female students are welcome; see flyer below for details. Stay tuned next week for our blog post recapping the first Lean In Circle of the semester.